Checking the mail seems like a harmless activity. Maybe even hopeful. Did you get a birthday card? That package from Amazon you were waiting on? You excitedly open the mailbox door and instead you see it. A medical bill. In a huge amount. So huge that you cannot possibly pay it by the time it’s due. Heart palpitations. Blood pressure raising. Panic sets in. 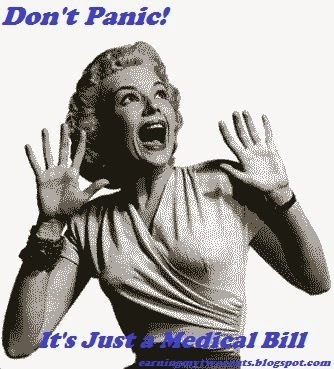 How do you deal with a huge medical bill without freaking out? It doesn’t matter if a bill is $100 or $1000, if you can’t pay it you can’t pay it. Don’t tell yourself that it doesn’t matter because it’s only $100. Because you know what? If you ignore it it will grow. Whatever the amount is, take it seriously. Ignored medical bills only end up in a plastic shopping bag that your wife will find when you move. And you still owe them, with interest and an angry wife. True story. Read the bill. Really, how often do you actually read all the line items on a bill statement? I thought so. If they made a mistake you can catch it and save yourself so read it over and make sure that the procedures and office visit dates that you are being billed for are ones that you received. Compare the bill with the explanation of benefits from your insurance company and make sure that the co-insurance amount, the amount you are being billed, matches up. If you have questions, call the doctor’s office or your insurance company. The due date on the bill is often a few weeks or a month from when you receive it, but you often have 90 days to pay it before it goes to collection. Medical offices and hospitals know that many medical expenses are unexpected and they have a huge portion of their clients who don’t pay their bills. They want you to pay so they will give you time to do so. I’m not advocating ignoring your bills until they go into collection, but you may have more time to pay than you think. Just because you think you can’t pay it doesn’t mean you actually don’t have the money. How much do you have in your savings account? Can you cut some expenses over the next 1-3 months and come up with the money? Can you make some extra cash in that time to cover it? You may have to tighten your belt but you may be able to pay it after all. Skipping going to the movies, going out to dinner, and a haircut may give you the money you need. And remember, pulling from your savings to cover a medical bill is always better than going into collection. Emergency funds are there for emergencies and that’s usually exactly what a medical bill is from. If you know you can’t come up with the money in a month or two, call the doctor’s office or hospital and ask them if they can put you on a payment plan. Before you call figure out how much you can actually pay each month so that you have a figure that you can suggest for a monthly payment. Hospitals especially are well prepared for this and they will put you in touch with a company that offers a payment plan. Small doctor’s offices will also sometimes put you on a payment plan if you ask nicely and they believe that you will actually pay. Often, these payment plans are interest free but you have to set up auto-drafts out of your bank account or will have to pay big penalties if you skip a payment. Interest free is always better than putting it on your credit card. Often the medical office/hospital will have a limit for what percentage of the bill they can set as your monthly payment or have a time limit and can only split the payment into 6 payments, for example. I know you don’t want to add another monthly bill, but at least its interest free and is usually short term. Depending on how much your monthly payments making an extra hundred or two a month may be able to give you the money you need to make the payments. Mystery shopping, doing online surveys, getting a part time job, babysitting, freelance writing, dog walking, and selling stuff on Ebay are all great ways to make some extra cash to help pay that bill. I just got hit with a medical bill that I could only split into 6 payments and the monthly payments are above my budget so I will have to use the extra income I get from mystery shopping to make the payments. Knowing that I have some extra money coming in really helps take the pressure off and makes me feel in control of this bill situation. Lace up those sneakers and let some pressure off while you pound pavement. De-stressing in healthy ways like exercising is not only good for your mental state so you don’t freak out, but also helps you stay healthy and hopefully avoid some more medical bills. But if you run at night wear reflective clothing so you don’t get hit by a car. That just defeats the purpose. Don't fret. These are just numbers, so always be on top of the situation. Furthermore, master the numbers so that you can see the right health care plans that will really deliver on both cost and benefit.